More than 30 Texas primary races are headed to a runoff. Here’s what you need to know. If no candidate in a primary election receives a majority of the vote, the top two vote-getters go head-to-head in a runoff. Here's everything you need to know about how they work and how to vote. While the March 6 Texas primary elections may be over, several races still don’t have a clear winner. So what happens now? We’ve compiled an overview of what it takes for a race to end up in a runoff, some of the upcoming primary runoff races and how Texas voters can learn more about the 2018 candidates and races. Click here to learn about the races and meet the candidates. What sends a primary election to a runoff? If no candidate in a primary receives at least 50 percent of the votes plus at least one additional vote, the top two vote-getters go head-to-head in a runoff election. For 2018, primary runoffs are scheduled for May 22. Are there runoffs in general elections? No. There's no required 50 percent threshold for a candidate to win a general election race, which means the candidate who gets the most votes wins. When is the voting period for the runoff? Early voting for the primary runoffs will take place from May 14 through May 18. Election Day is May 22. Why are runoffs so much later than the primaries? After the primary, the secretary of state’s office has up to 30 days to certify the votes. Under the Texas Election Code, runoff elections can't be held earlier than the 20th or later than the 45th day after the final canvass of the primary votes is completed. So, in which 2018 primary races will there be a runoff? On the congressional side, six Republicans and two Democrats in the 38-member Texas congressional delegation opted not to run for re-election, which led to some packed races to replace them. 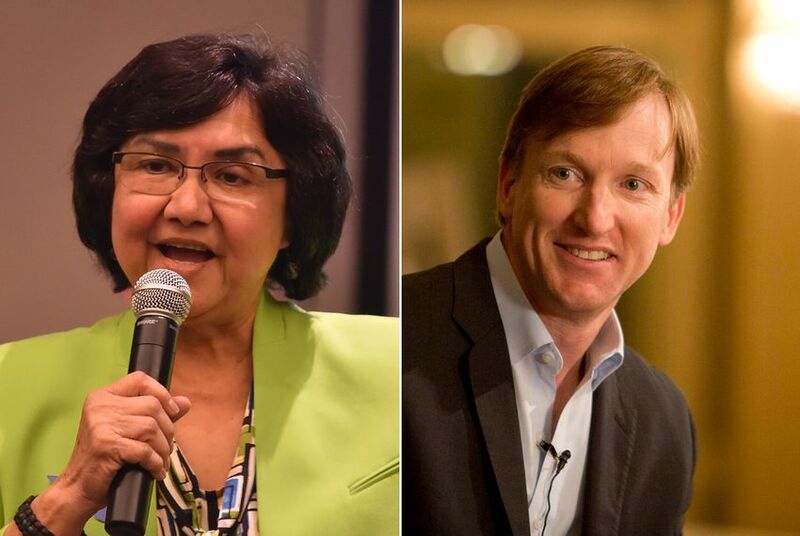 The most crowded included 18 Republicans and four Democrats running for the seat U.S. Rep. Lamar Smith, R-San Antonio, has held for more than 30 years. How do I know if I’m eligible to vote in one of the runoff elections? If you voted in a party primary, you're eligible to vote in that primary's runoff. According to the Texas Election Code, if you haven't affiliated with a particular party during the same voting year — by either participating in a party’s primary or convention — you can vote in any party’s primary runoff election as long as you're registered to vote for that race, according to the Texas Election Code. “So if, for example, a voter who participated in the Democratic primary wants to vote in a Republican primary runoff, he or she will not be accepted to vote in that Republican primary runoff race,” said Sam Taylor, a spokesman for the Texas Secretary of State's Office. If you voted in your party’s primary and choose to vote in the runoff elections, you don’t need to re-register to vote, Taylor said. What form of ID do I need to bring to vote in a primary runoff? The same form of ID that’s required to vote in a primary is needed for a runoff. We've gone over acceptable forms of ID in a previous Texplainer here. What does turnout typically look like for primary runoff elections? Voter turnout in Texas is historically underwhelming (just 16 percent of the eligible voting population cast a ballot in Tuesday's primaries). If history is any guide, May primary runoff turnout will be low. In 2012, roughly 11 percent of registered Republicans voted in their party’s primary compared to 4.5 percent of Democrats. When it comes to voting numbers, typically half of the number of voters who cast a ballot in the primaries will show up to a runoff, according to the secretary of state’s website. How can I learn more about 2018 candidates and races? The Texas Tribune is following the 2018 races closely. Sign up for The Brief for a daily rundown of election and government news in your inbox. And join our first-ever Facebook group, “This Is Your Texas,” to engage with Tribune staff, policy experts and elected officials in a constructive dialogue about policy challenges facing our state.